Mufflers may be damaged and need to be repaired at some time or another. The growing amount of clean air legislation makes it wise to check mufflers and ensure they are functioning properly on a regular basis. Loud emissions are a sure sign of a problem in the Arizona exhaust system. Replacing a muffler may be required and is a job that is best left to experienced professionals at a Tempe Arizona muffler repair shop. These firms offer their clients convenient hours and are sure to fix any damage that is needed. Installing custom mufflers can make cars more fuel efficient. Mufflers can also be customized to increase the performance of a vehicle. Arizona Custom exhaust is another project that can be handled by a professional mechanic in Scottsdale, Arizona. Bending the pipes and running the entire system is a job that can only be done by a qualified professional that has the equipment and experience. Installing a custom exhaust improves the performance of the newest sports cars. Exhausts can be installed and will increase the total amount of horsepower that is developed. Improving the sounds of a vehicle is another benefit that installing a new exhaust will provide. A Scottsdale AZ exhaust repair shop handles a number of jobs for their clients every day. The costs for gasoline make it essential to keep vehicles operating at their most efficient. Professional mechanics have access to the latest diagnostic tools and have the experience that is required to understand and fix a number of problems. They can do any of the preventive maintenance jobs that keep cars on the road and reliable. Installing a custom exhaust or muffler is one choice that these providers offer their clients. Exhaust systems are an essential component of a vehicle and can boost the performance of any car, motorcycle or truck. Exhausts are a really important piece of your car, and it must be regularly maintained so your car can get a long lifespan. As a professional Scottsdale mechanic, Scottsdale Muffler and Automotive can either do an exhaust repair or replace it with a new one. We have more than 80 positive reviews and testimonials that show our level of commitment and passion in this line of work. We aim to bring satisfaction to our customers, and that is one of the main reasons they keep coming back for our high-quality services and refer us to friends and family. Offering the best affordable prices on the market, we guarantee the most expert Scottsdale exhaust repair. We also have the knowledge and the expertise to install a Scottsdale custom exhaust for your car. If you want to get one installed, we offer our services to everyone in Scottsdale and surrounding areas. Scottsdale custom exhausts are key for better performance in your vehicle, as it produces a more effective pathway for exhaust gasses to exit your exhaust system, allowing your engine to take in more air. Remember that our Scottsdale exhaust mechanics follow the noise ordinance law so that you can get the look and sound you want on your custom exhaust system without having to worry about getting pulled over by the police, and that is exactly how good and passionate we are about our work. Having properly functioning muffler and exhaust system not only helps your car run smoother but helps the planet as well. A lot of people think their car’s exhaust system is intended only to lessen noise, but it is also responsible for reducing harmful ejections from entering the atmosphere. A properly installed Scottsdale exhaust system and muffler not only sound better, their better for you, your car, and the environment too. 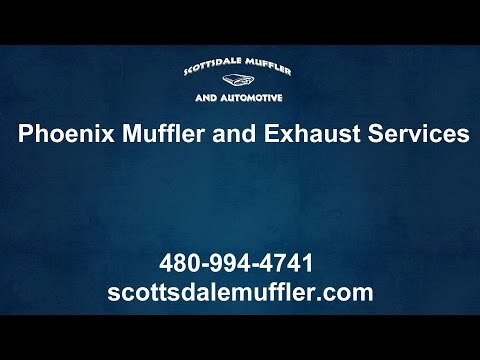 Scottsdale Muffler is the leader in mufflers and exhaust service. Scottsdale Muffler has been in business for well over a decade. They really work hard to earn your business. Scottsdale Muffler takes pride in providing high-quality mufflers, pipes, and other exhaust components for their customers. Scottsdale Muffler has highly trained Scottsdale exhaust system technicians and the capability to custom bend exhaust pipes to fit any make or model of vehicle, we really are the place to bring your car in for all your exhaust system repair needs! We service the entire Phoenix Valley as well, including Cave Creek, Glendale, Mesa, Tempe, Chandler, Gilbert and other cities near Phoenix. Call for a free estimate on your custom project, and whether it be a customized exhaust system or restoring a classic car exhaust, Scottsdale Muffler is the best Muffler Shop in AZ. It is really hard to find someone better than the skilled mechanics at Scottsdale Muffler & Automotive since we have decades of knowledge and expertise with all kind of vehicles and custom exhaust systems. We do this type of production every single day, so you can personally come and see how it is done. Go ahead and let us improve the performance of your car and show you what else we can do to amaze you. 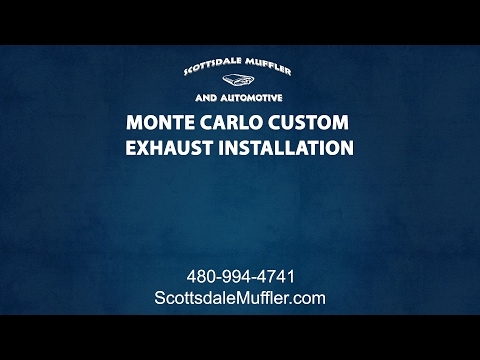 Give us a call at 480-994-4741 and ask us more about our Scottsdale custom exhausts. There are some benefits to having custom motorcycle exhaust, here are 3 big benefits. Loud pipes sound good! Stock exhaust, as you may already know, is not very loud. If you want to give your motorcycle that low rumble sound, then custom motorcycle exhaust is the way to go. You’ll have a great sounding bike that people can actually hear. A loud motorcycle exhaust can also save your life. When you’re on the road on your motorcycle, you are at an enormous drawback because you are much smaller than the other automobiles on the road which makes you tougher to see. What makes it even more hazardous is when other drivers are too preoccupied to even think about looking for vehicles other than cars and trucks. When you have custom exhaust put in, your motorcycle is going to be much louder than it was with the stock exhaust which means the other drivers on the road will certainly be able to hear you coming, and will at least become more alert. Also a custom motorcycle exhaust just looks better. The stock exhaust that comes with your motorcycle looks plain and boring. A custom motorcycle exhaust gives your bike a more personalized look, and you can find a variety of designs that fit any style of bike exhaust in Phoenix AZ. A bit of grease or anti-seize will help hold them in place. Next, place the head pipes into location, put a smear of anti-seize on the studs or bolts and tighten the retentive necklaces just enough to keep the pipes from flopping around. Give the open end of the pipe a light coat of anti fiction and slip on the accumulator (Y-pipe) or muffler as the case may be. If you need a hammer to pound any part of the exhaust system together, stop and find out what’s gumming up the works before proceeding. Remove the old exhaust gaskets (if they haven’t fallen out already), take a good look in the ports and excavate any loose carbon that might avert the new pipes from seating properly. Connect the new seals. Resist the temptation to force everything together, since all that will do is pre-load the exhaust system. After a few miles the stiffness will combine with the tremor to snap off the mounting bracket or crack the exhaust pipe. Better to spend an hour filing, doing whatsoever you need to do now to achieve a proper fit, than to ride home with your recently installed exhaust dragging along the pavement. All the fragments should fit together with a minimum of power. After everything has been properly connected and correctly aligned, you can stiffen it all up, starting at the cylinder head. After the collar bolts are snug, proceed to tighten the rest of the hardware in turn, working your way backward toward the muffler. Re-install any ancillary components removed during this process. By tightening the head cylinder first, you guarantee it places correctly in the port and seals appropriately against the gasket. Scottsdale Muffler’s muffler and exhaust systems not only help the planet but help your AZ car run smoother as well. Scottsdale & Tempe Arizona Custom muffler shop that preforms repairs on all makes and models at unbeatable prices! Our Repair Specialists preform any and all repairs to your Scottsdale car! Finding a licensed repair shop such as Scottsdale Muffler is key to ensuring your car gets repaired correctly. 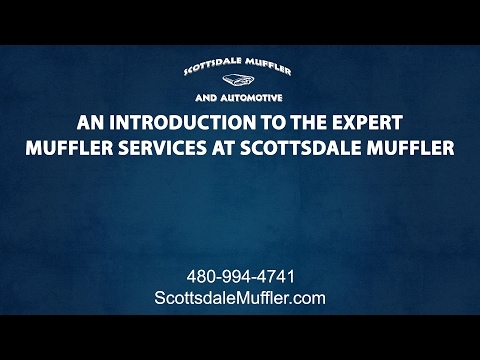 Great prices, amazing reviews, and over 20 years of experience, is what sets Scottsdale Muffler apart from the rest!